First of all, it is important to understand that a nuclear power plant operates in almost entirely the same way as a coal-fired plant. The chief difference is in the source of heat. For the coal plant, pulverized coal is combusted in a giant furnace to deliver heat to water, thereby generating steam that drives the turbines. Nuclear plants use energetic fission events to create heat, generating steam that drives the turbines. Did you pick up on the similarity? Thus nuclear plants are merely heat engines that extract useful work from some fraction of the thermal energy flowing from a hot source (flame or fission) to a “cold” source (condenser). The hourglass-shaped cooling towers that came to symbolize nuclear power may just as often be found in modern coal-fired plants away from large bodies of water. Conversely, nuclear plants near large bodies of water (like San Onofre in SoCal) lack cooling towers and are rather compact installations. 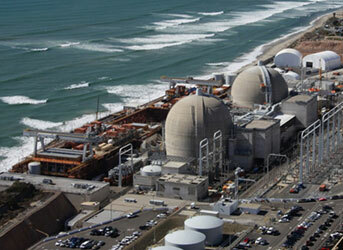 Twin 1.1 GW reactors at San Onofre Nuclear Plant. No cooling towers necessary. From Southern California Edison. Okay, I just had to get that off my chest—partly to confront my Southern heritage. The main point so far is that nuclear plants are only complicated in how they produce their heat. After that, it’s standard fare. And due to their similar design, both achieve something like 30–40% efficiency in converting thermal energy into useful electricity. Heavy nuclei can be split apart by blasting them with high-energy particles and having extremely good aim. But this is no fun, since the requisite energetic particles can be hard to produce. Nature provides a subtle trick, however, in that three semi-stable nuclei are capable of splitting apart by the mere introduction of an extra (slow) neutron. These are 233U, 235U, and 239Pu. That’s uranium and plutonium to most of us. The preceding superscript denotes the total number of nucleons—another name for protons and neutrons—contained in the nucleus. Uranium always has 92 protons, while plutonium always has 94 protons (it’s what makes them what they are: chemically, it’s all about how the neutral atoms behave, containing 92 and 94 electrons in differing configurations, respectively). This leaves 141, 143, and 145 neutrons in 233U, 235U, and 239Pu, respectively. As an aside, what pattern do you notice in the names uranium and plutonium? Hint: there is one element in between. Further hint: its name is neptunium. Considering that Pluto has been voted out of the planet club, perhaps it’s overdue that we vote plutonium off the periodic table! Hmmm. Astronomy textbooks are changing, but I suspect that Pluto’s planetary status will be immortalized in chemistry textbooks. Left alone, 233U, 235U, and 239Pu will spontaneously decay (not by fission, but by emission of an alpha particle: two protons and two neutrons in a tidy chunk) on a timescale, or half-life, of 159,000, 704 million, and 24,000 years, respectively. But if we add one more neutron to any of these, they stand a significant chance of splitting into two large chunks and a few spare neutrons. The aggregate particle count does not change in the process. The extra neutrons are left to wander into other fissile nuclei and keep the process going—called a chain reaction. In order for this to work, one must control the likelihood that neutrons get absorbed by non-fissile material (including control rods), and have enough fissile nuclei about to keep the process humming (critical mass). For instance, if we add a neutron to 235U, it momentarily becomes 236U before splitting into, for example, 97Rb and 137Cs plus two spare neutrons. Because heavier nuclei are increasingly neutron-rich (protons repel each other, so the fewer the merrier in a large nucleus), the “daughter” nuclei are exceedingly neutron rich for their tax bracket, and start converting neutrons to protons via “beta” decay, ejecting high-energy electrons in the process. Thus we say that the daughter nuclei are radioactive and emit damaging (ionizing) radiation in the form of fast electrons that can rip right through your DNA. In the above example, the daughter nuclei are short-lived: within a few seconds, the rubidium beta-decays several times through strontium and yttrium, pausing at zirconium for about a day, then spending a minute as niobium, finally retiring as a stable isotope of molybdenum (97Mo). The cesium lasts for about 30 years (half life) and beta-decays to a stable barium isotope (137Ba). There is no controlling what the daughter products will be. In practice, they cover a distribution of middling-sized nuclei in two groups (one around 135 nucleons and the other around 95—sometimes called “fish and chips”—see figure below). As a rule, they will be neutron-rich and undergo beta decays on a whole range of timescales—some getting stuck for thousands of years. It is also possible that the absorbed neutron fails to spur fission, and the nucleus keeps absorbing neutrons to create “trans-uranic,” or actinide radioactive waste. The unstable daughter nuclei (fission products) and trans-uranic nuclei are what make spent nuclear fuel hazardous—often for very long times. Fission yield probabilities for the three fissile nuclei, generally yielding a big nucleus and a small one. Yields for the three nuclei are more similar than different. The number of nucleons is plotted on the horizontal axis. We’ve looked at the accounting of splitting atoms, but where does the heat come from? When these nuclei and neutrons erupt from the unstable nucleus, they fly apart, carrying kinetic energy. As they rudely bump into surrounding atoms, they deposit this energy as a cacophony of motion/vibration in the solid lattice. We call this heat. A typical fission event releases about 200 MeV of energy—the energetics of which we will revisit later. Of the three slow-neutron fissile nuclei, only 235U is found naturally. The other two have substantially shorter half-lives, so the 233U and 239Pu provided in the initial supernova-generated stock of material for Earth has long since decayed away. Meanwhile, 235U has decayed much faster than its sister 238U, which has a half-life of 4.5 billion years (coincidentally about the age of Earth, so we have half of our original stock of 238U). Today, 99.3% of natural uranium is the impotent 238U variety, the remaining 0.7% being the fissile 235U. This is a very significant fact. But there is a back door. Reactor fuel is typically enriched to be 3–5% 235U, leaving lots of 238U in the reactor. When 238U happens to gobble up one of the wandering neutrons, it becomes 239U, which is unstable and undergoes two beta decays in a matter of days to become—presto!—239Pu. Now we have two fissile contributors in the reactor, and in practice 239Pu contributes something like a third of the total energy in a typical reactor. Some reactors are designed to be especially efficient at generating 239Pu, and these are called breeder reactors, built to make weapons material. On the energy front, breeders open up 140 times more uranium supply than is found naturally in 235U, by using the ubiquitous 238U nuclei. The principle problem with breeders is that plutonium is chemically distinct from uranium, making it very straightforward to isolate and make bombs. Conversely, the two isotopes of uranium are notoriously difficult to separate (enrich). Enrichment is a significant hurdle to those who strive to have nuclear weapons. Abundant plutonium would change the calculus considerably, tipping the scale toward weapons proliferation. A similar back-door trick can be used to breed 232Th into fissile 233U (taking a month to work through the beta decays). Thorium is several times more abundant in Earth’s crust than uranium. It’s not fissile out of the ground like 235U is: some assembly required. In that sense, it is not terribly different from 238U. One of the main differences is that the bred 233U is often contaminated with 232U, which has a 69 year half-life and is a prodigious emitter of high-energy gamma radiation along its decay chain. After one year, the escalating radiation level from uranium that is 5 parts per million 232U is seven times higher than that of reactor-grade plutonium, and about 50 times worse than weapons-grade plutonium (reference). And because the gamma ray emission is higher-energy than the corresponding emission from plutonium, it is harder to shield. The bottom line is that 232U contamination of thorium-produced 233U makes 233U very dangerous to handle, which is considered to deter proliferation (easy for terrorists to find uneducated martyrs, harder to find nuclear technicians willing to sacrifice their lives). 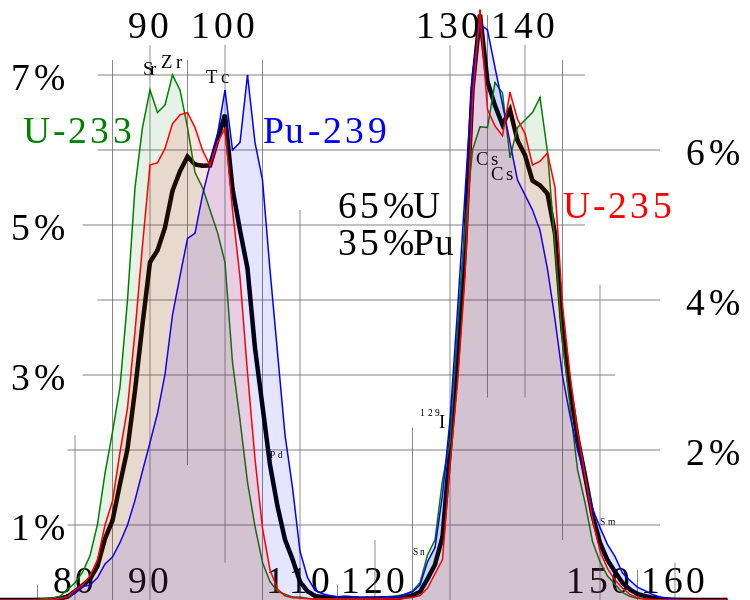 Deliberate contamination with 232U would help curtail proliferation, and would make the substance easier to detect from its gamma emission. I will no doubt get a lot of flak for not gushing over the advantages of thorium over conventional uranium reactors. It is not hard to find accounts extolling all the virtues—including chewing through our current stock of spent fuel (though no help on daughter products) and passive dumping in a loss-of-cooling emergency (if the salt plugs work properly). But it’s not all a bed of roses, and I sense that there’s a bit of “hopium” mixed in. I will need to spend time studying thorium more fully before I can say much more. Because it’s fun to apply E = mc², I’ll use the example above of 235U plus a neutron producing 97Rb and 137Cs plus two neutrons. A neutron has a rest-mass of 1.0087 atomic mass units (a.m.u. : 1.6605×10−27 kg), and 235U has a rest-mass of 235.043 a.m.u. On the other side, 97Rb is 96.937 a.m.u. and 137Cs is 136.907 a.m.u. If we add up the initial mass, we get 236.05 a.m.u., and for the final mass we get 235.86 a.m.u. (235.83 after all beta decays are done). Somebody stole 0.2 atomic mass units! Putting this into E = mc² (with mass in kg and c ≈ 3×108 m/s), we find the missing amount to be 3×10−11 Joules. It might not sound like much, but a gram of 235U contains 2.6×1021 atoms, for a net of 76 GJ of energy. This amounts to about 20 million kilocalories per gram—over a million times more potent than chemical energy. This is why nuclear is such hot stuff—literally. To put a scale on things, the world’s energy appetite, at 13 TW, would require the expenditure of about 20 grams of 235U per second: a seemingly paltry amount. That works out to about 600 tons per year. In terms of total uranium (235U is only 0.7%), we would therefore need to dig out about 800,000 tons yearly. At present, the world uses about 60,000 tons of uranium per year (correcting for the fact that 85% of the yellowcake ore—U3O8—is actual uranium), even though only 0.75 TW (thermal) of power currently derives from nuclear reactors worldwide. Scaling this number to 13 TW implies a need for 1 million tons of uranium per year, in reasonable agreement with our first estimate. So how much uranium resource exists in the world? The World Nuclear Association puts the number at about 5.4 million tons of ore (4.6 t U). At present rates of use and no more exploration, this suggests 80 years of resource. But nuclear is just 6% of global energy production. In the spirit of stacking each energy resource up against our total demand—as I have done for solar, wind, tidal, hydroelectric, etc.—the implication is that we would deplete our resource in a mere 6 years if we required conventional nuclear power to be our sole source of energy! That’s the scary/extreme version of the story. We would no doubt identify additional resources (at higher extraction cost) if push came to shove. Presently, nuclear fuel is not the cost driver for generating nuclear electricity, so there is room for mining costs to increase before nuclear gets more expensive (already loses economic competitions, though). Still, doubling or tripling the resource does not break us out of the few-decade regime. Therefore conventional nuclear cannot provide a long-term replacement for fossil fuels—and it’s not nearly as convenient in any case. If it became economical, we could harvest uranium from the ocean, where each cubic meter of seawater contains about 3 mg of uranium (3 parts per billion). At a volume of 1.3 billion cubic kilometers, this translates to 4 billion tons, extending the supply by a factor of nearly 1000. We also must consider the breeder angle. Only 0.7% of natural uranium is fissile, so breeders can extend the scope by a factor of 140. Now our decade scale is a millennium scale. Likewise for thorium, which is a breeder program from the start, and arrives on the scene more abundant than uranium. You are indeed a patient lot, bearing with me through a lengthy pedagogical exposition when all along you just want to know whether nuclear will be a major component of our future and can scale sufficiently to put our minds at ease with respect to energy scarcity. And my answer is: I could imagine it going either way. After all, I would likely not be motivated to “do the math” on our various energy options if I thought that nuclear would simply take care of business without worry. Even though nuclear fission does not represent a renewable resource (at best we’re dealing with millennia, not eons), breeder programs can make it last long enough for me to throw it into the “abundant” box. Absent breeders, I must put conventional nuclear employing conventional mining into the “niche” box, since it can’t supply over a quarter of our demand for a meaningfully long period. Ocean harvesting allows conventional nuclear to jump straight over “potent” back to “abundant.” It’s worth emphasizing that we can’t simply ramp up the nuclear we know and—ahem—love, and expect to get much out of it. So the prospects for nuclear are all over the map. As such, economic, sociological, and practical concerns—more so than physics/math—will determine how large a role nuclear will play. Let’s start with the obvious. Nuclear represents yet another way of creating electricity. Between solar photovoltaics, solar thermal, wind, hydroelectric, geothermal, tidal, wave, ocean currents, etc.—granted, some of these are puny—we are not running short of ways to generate electricity. Nuclear has no special power over the others to alleviate the liquid fuels crunch we will soon experience. Like all the other options, it’s no panacea. It’s not the silver bullet we might hope to find. Nuclear power does not tolerate rapid changes in power output. It can adjust over a matter of hours, not minutes or seconds. It is therefore not useful for balancing short-term intermittency arising demand fluctuations or from wind and solar, etc. On the flip side, it does not have problems with intermittency. It could therefore be a useful baseload source, which accounts for about a third of peak electricity demand, and about two-thirds of total electricity produced. Unlike solar or wind, nuclear will not be distributed, but will be centralized into large, expensive, high-tech facilities. Successful operation of a large fleet of nuclear power plants requires a highly functional, stable society with an educated workforce—you know, like Homer Simpson and buddies Lenny and Carl (I was surprised to learn that Lenny “actually” has a master’s degree in nuclear physics). So nuclear looks fine if our transition to the future is smooth and orderly. If we get caught off guard by energy scarcity—possibly leading to hoarding, resource wars, severe economic crashes, and other surprises—then it may be very difficult to mount a strong nuclear response. In other words, nuclear is the most technologically challenging of our primary energy options, so that we risk not having it together enough to pursue the nuclear road when the need becomes apparent. Things would have to get pretty bad before this self-limiting effect kicks in, and I cannot easily assess how likely such a scenario might be. As such, this consideration is not the reason I’m not hyped about nuclear, but it is certainly a factor to bear in mind. Nuclear requires advanced planning, and is not going to be an effective pinch-hitter in a crunch. Then of course we have the pesky issues of waste storage (unsolved worldwide after five decades), proliferation of weapons-grade material (relevant for breeders), and safety. True, radiation levels outside a coal-fired plant are higher than outside a nuclear plant—until they’re not. Three-mile Island, Chernobyl, and Fukushima certainly violated this “truism.” When nuclear plants have trouble, the trouble can be pretty unsettling. This brings us to the societal angle. People fear nuclear power, almost as much as they fear nukular power. First, we form a mental connection with the most destructive weapons known to man. The connection becomes real when proliferation is considered. Second, when nuclear plants have trouble, it’s big news—leading to out-sized fear. More people die from bee stings than from shark attacks, yet our fear of the shark is vastly greater than our fear of bees. Crazier yet, we don’t run screaming from cars—as deadly as they are—and will actually wade into a parking lot packed with these killers. Third, we have not been able to implement a waste storage scheme yet, holding spent fuel indefinitely at nuclear plants in swimming pools that were meant to provide temporary storage only. 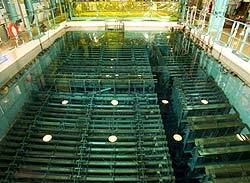 Spent fuel rods stored in a "temporary" pool at a nuclear plant. Public acceptance of nuclear power plants tends to run counter to their acceptance of Congressional Representatives. Huh? We (in the U.S.) tend to despise Congress, giving approval ratings as low as 10% for the job they do. Meanwhile, our local Representative has a 90% chance of re-election because they’re perceived to be one of the good eggs. Conversely, we might overall begrudgingly accept nuclear power at a national level, but not in our district, please. We invoke the NIMBY (not in my back yard) response to almost any new proposed facility (wind, solar, coal-fired plant, etc. ), but our aversion to nuclear is on a whole different level. As a scientist who understands what nuclear energy is all about—that a power plant cannot detonate, that nominal radiation levels outside the plant are quite low, that natural radiation is far greater (especially during air travel), and that nuclear fuel is hyper-efficient compared to chemical sources—I don’t personally harbor an intrinsic knee-jerk fear of nuclear power. Nor do I discount the waste storage complications, the potential for proliferation, or the finite nature of the resource. These are legitimate societal concerns (see the Union of Concerned Scientists’ super-solid analysis on the pros and cons). I am also aware of the complexity inherent in building and maintaining a nuclear plant, and that the energy derived is never going to be “too cheap to meter,” as was once promised. Sure, molten salt thorium reactors could ease some of these concerns (and bring about new ones). As I said, I need to look at this option in more depth. One thing I know already: nuclear is far more complicated than many of our other other options (e.g., solar, wind), relies on rare materials for fuel, and has serious societal barriers. That said, it has some very nice properties as well: stable power output, low carbon, potentially abundant fuel (if economies allow), and decades of experience (on certain reactor types). In the end, I think nuclear is likely to play an increasing role in our energy story. Energy hardship will trump concerns over waste, proliferation, and safety. As long as such hardship does not bind us in an Energy Trap or plunge us into dysfunction, we will likely build more plants. But because nuclear does not smack the primary problem right on the kisser (fossil fuel substitute), I doubt it will be heralded as the answer to our prayers, and imagine that its role will be correspondingly modest. We’ll see fusion next week. This entry was posted in Energy, Energy Scale and tagged fission, nuclear by tmurphy. Bookmark the permalink. First, Tom, thanks for the analysis. Nuclear has no special power over the others to alleviate the liquid fuels crunch we will soon experience. Nuclear represents yet another way of creating electricity. It is, of course, possible to use electricity to power a facility that turns atmospheric CO2 into liquid hydrocarbons that today’s engines would be happy to burn. Might you be willing to “do the math” to figure out what kind of electric generation we’d need to replace petrochemicals? Is it even theoretically practical? Turning electricity into liquid fuels would indeed be a super-nifty trick and I would fall on my knees upon learning that we had developed a viable technique for doing so. I’m no chemist, but think the hold-up is that we don’t have a reasonable catalyst that allows us to put the pieces together. You can sort of turn electricity into liquid fuel via the Fisher-Tropsch synthesis. If you combine hydrogen and carbon monoxide (a mixture referred to as syn-gas) over a bed of a transition metal catalyst [Cobalt, Rhodium ($$$), or Ruthenium] at elevated temperature and pressure, you will synthesize hydrocarbons. There are of course issues with generating the right carbon length with a degree of precision. To generate syn-gas you can sinter organic material (trash) at high temperatures (arc furnace) in a low oxygen atmosphere. In addition to high electricity demands of such a process one would have to deal with securing an adequate and reliable supply of catalyst to operate such a process at global scale. are advocating capturing waste CO2 from existing coal plants and using wind-generated electricity to turn it into hydrocarbon fuels. They analyze the water, combine some of the H2 with the CO2 via reverse water gas shift to form CO and water, and then use Fischer-Tropsch synthesis with the CO and the remaining H2 to create the hydrocarbons. They claim 55% efficiency and seem to suggest that it’s economical if oil gets into the $130 – $150 / barrel range, or even at today’s prices with today’s subsidies. The coal plants would continue to run as they do today; the only difference would be that the CO2 they already produce would be converted (using another energy source) into gasoline before being released into the atmosphere (after being burned in internal combustion engines, of course). Or, put another way, wind (in their example) power + water + coal plant waste => gasoline. Somewhere I think they suggest that, in the vague and distant future, when we start to transition away from coal, we could then look to sequestering atmospheric coal instead of capturing it from coal plant emissions. There’s lots of math there that passes my very uncritical sniff test…though I’m far from convinced that it’s not just yet another pie-in-the-sky investor-milking scheme. I’d appreciate if you could do the math and your own sniff test…. Several of these are designed around solar power, but the Yale article says “the expensive parts are not the inputs of CO2 or water, but rather the expense of the mirrors to harness the sun’s heat.” If nuclear is cheaper, it might work better (and Green Freedom is already designed for nuclear). Light-water reactors may not run hot enough for some of these, but molten salt and fast reactors run a lot hotter. Of course it’s early days yet, and we’re probably best off replacing power plants before doing this. The big holdup is thermodynamics. You need to put lots of energy into carbon dioxide to get less energy in fuel out. Any means of storage will have a “tax” of this sort: more energy in than is ultimately delivered. But yes, it is fundamentally a thermodynamic problem. In order to break apart a hydrocarbon, you have to put in energy to “climb over the potential barrier.” This is in the form of heat/spark/flame. Otherwise gasoline would spontaneously combust at room temperature, finding its way to a lower energy state. We like that barrier. So even though you have to supply some energy to overcome the barrier, you’ll get net energy out, part of which can go into keeping the flame going. We can think of it as like a mountain lake: the water could deliver energy if allowed to flow to the valley below, but it would first have to climb over the local peaks to get there. The problem with trying to go in reverse—assemble carbon and hydrogen into a hydrocarbon—is that you have to supply enough energy to go from the valley floor to the peak. Then you’ve got all this thermal (random) energy, and the last thing these sugar-high atoms want to do is settle down together, even if energetically favorable. It’s really an entropy problem: the atoms do not want to spontaneously give up entropy. It is in this sense it’s fundamentally an entropy problem, preventing a brute-force approach. Catalysts find a back door for assembly. Not just entropy, but enthalpy as well. Catalysts can only promote a reaction that enthalpy allows. Los Alamos National Laboratories has already produced a concept for producing liquid fuels from atmospheric CO2, powered by standard light water nuclear reactors http://bioage.typepad.com/greencarcongress/docs/GreenFreedom.pdf . This would be a carbon-neutral process. Initial estimates are that the pump price for gasoline would be $4.60/gal., with possible reductions to $3.50/gal. with scale and refinements. They say no major technological breakthroughs are required—all off-the-shelf technologies and industrial processes. Texas A & M apparently is partnering with Los Alamos for an early phase of the Green Freedom project. I note that if you combine oceanic fuel *and* breeding, you get a useful life >100,000 years. At which timescales geological erosion replenishing the oceans becomes significant. John “he who refuses to do arithmetic is doomed to talk nonsense” McCarthy figured uranium was good for a billion years, based on uranium in the crust eroding into the oceans for us to pick out; arguably this is “renewable”, capable of lasting as long as the Sun. AIUI Three Mile Island didn’t release any significant radiation, just melted down into unusability. I would want to evaluate the rate at which erosion delivers uranium to the oceans. For instance, it could indeed make it a billion-year resource, but at effectively 1 GW of power, which isn’t useful. Then again, it could be at a practical level. Of course, combing the ocean is a time-consuming process on its own. http://www-formal.stanford.edu/jmc/progress/cohen.html is what I was thinking of. Another note: increasing supply by 2-3x doesn’t change things much, but if doubling the price increased the supply by 10, then that’d be significant. http://www.americanenergyindependence.com/uranium.aspx claims supply goes up exponentially with price. That seems like a highly speculative estimate. But even if it’s true, it doesn’t change the basic conclusion of this article, which is that nuclear IN IT’S CURRENT FORM is not a long-term solution. We would have to switch to something more high-tech, whether it’s breeder reactors or mining the ocean. And by doing that, the cost and risks increase so much that Concentrated Solar with thermal storage just seems hands-down better (for electricity, anyway. Liquid fuel is the elephant in the room). IFRs undermine many of the assertions and assumptions in this post, since they directly address cost, proliferation, safety and waste issues in an elegant and entirely workable manner. GE has an offer now being considered by the UK to build the first two commercial-scale PRISM reactors, fast reactors that constitute an IFR when paired with the pyroprocessing fuel recycler. As for the production of liquid fuels from nuclear, excess heat and electricity can be channeled into electrolysis and the resulting hydrogen can be used to make ammonia, which can be used as a fuel in internal combustion engines. Load following is also not a problem for fast reactors, though since the fuel for IFRs is essentially free (they use overly-abundant depleted uranium for fuel) it would make more sense to just leave them running full-out and use the excess for desalination and liquid fuel production than to try to ramp them up and down to adjust to the vagaries of grid fluctuations. I admit, I’m no expert on IFRs. But I do know that the main cost of our current fission plants is the cost of building and securing the plants themselves- the cost of the fuel is insignificant. And that’s with a fair simple and well-developed technology. Adding a new layer of technology which results in waste that’s even more dangerous is hardly going to reduce the cost, will it? And the cost of solar keeps going down with improved technology, while the cost of nuclear keeps going up as new safety hazards are discovered. Physical scientists need to open up their field of view to include noticing the way that biological scientist view improvements. They understand that there is a force called “natural selection” that leads to a process called “evolution”. Many technologists, as opposed to scientists, apply similar principles to invention and creation of useful commercial products. As various inputs change, they gradually adjust their efforts to overcome the primary challenges and to take advantage of beneficial features of their environment. We have stuck with what is essentially the first generation of a potentially long evolutionary species of nuclear energy technology simply because there was no real stimulation to adopt techniques like breeding, though we have increased the incore conversion of U-238 a bit by starting with slightly higher enrichments and loading in burnable poisons like boron. Current light water reactors get a fair portion of their energy from indirectly fissioning U-238 – roughly 30% at the end of a typical fuel cycle. When uranium costs increase, or when people worry themselves sick about “what to do with the waste”, technological evolution will adopt the already recognized and partially developed ways of improving fuel utilization. Since we already know it is possible to move up the evolutionary ladder to full scale breeding – not necessarily in a single leap – my math already shows nuclear fission, using our terrestrial endowment of U-235, Th-232 and U-238, as a virtually inexhaustible fuel source. Why do you say that the new technology (presumably you’re talking about IFRs) results in waste that’s even more dangerous? Quite the opposite. The waste from an IFR would only be radioactive beyond the levels of natural uranium ore for about 300 years, and its radiotoxicity will decline far below that very quickly. As for your claim that solar is already considerably less expensive than nuclear, I don’t even have to look at your link to say that it’s a completely spurious argument. Solar produces virtually nothing in the dead of winter and is only intermittent at its best. Comparing it with a reliable baseload power source that’s dispatchable 24/7 is simply a sham argument. I don’t care if it’s free, it still can’t provide the energy a modern society requires. As for the cost of nuclear continuing to rise, you must not be familiar with the construction of the first AP1000 reactors in China (soon to be built in the USA too). The first-of-a-kind China reactors are being built at a cost of about $1,650/kW, which the Chinese expect they’ll be able to reduce to about $1000 once their supply chain is all in place. You do yourself a disservice in calling solar a sham. First, saying that solar produces virtually nothing in winter borders on absurd. The NREL study has the real data. For San Diego, the worst month—December—gives 81% as much energy as the yearly average. The worst year in the 30-year sequence gave 63%, and the best yielded 95%. Meanwhile, St. Louis, MO (my benchmark for average/median U.S. solar site) gets 69% of its yearly average in December. Saying that solar delivers “virtually nothing in the dead of winter” does not fly. Second, saying that solar can’t provide energy that modern society needs—even if free—also misses the mark, in my book. Many modern facilities get power from solar. Coupled with storage (admittedly hard, but so is nuclear), it works quite well. The comment by Charles specifically talked of concentrated solar thermal. Such schemes naturally build storage into the design. And FWIW, San Diego gets 85% of its annual average in December, while St. Loius gets 59%, in terms of concentrated solar. You’ll see that the amount of electricity produced is absolutely trivial. Even if they had storage it wouldn’t amount to a hill of beans, and this after Germany has committed over 75 billion Euros to solar. “Many modern facilities get power from solar.” Really? So do my yard lights. Your statement is meaningless to any real discussion of the capabilities of solar. It’s akin to the oft-repeated cliché that enough solar power falls on the planet every day to power the whole planet for X days/years/whatever. It’s meaningless. Tom: Saying that comparing solar to nuclear is a “sham” because solar “doesn’t provide baseload power” ignores the fact that we don’t WANT baseload power. Look at the demand curve sometime. The difference between minimum and maximum demand over a year is often 3:1. “Baseload” is touted simply because it’s what certain technologies provide, not because it’s what we actually need. That’s why real-world electricity supply is made up of a combination of baseload, load-following, and peaking generators. In reasonably sunny areas (like much of the US, China, and India) solar actually matches demand much better than constant baseload generators do, requiring less storage than adding more baseload would to try to capture a larger share of the peak! For really long-term projections, something else to consider with ocean extraction might be concentration. If we pull half the uranium from the ocean, it’ll get twice as expensive to pull more, assuming the uranium mixes well. I didn’t have the heart to bring this up, but yes: it gets harder as one goes forward. If, on the other hand, ocean uranium buys us 1000 years, it won’t get twice as hard for 500 years. I think I could stomach this. I if recall, the ocean is not the only source of massive but diffuse uranium deposits. There are also other massive and diffuse sources. For example, all granite rock contains uranium–usually a few micrograms per gram, which is not trivial. Granite rock is the commonest igneous rock in the Earth’s crust. And there are also many other diffuse sources of uranium in the Earth’s crust. It would not be possible to exploit these diffuse and massive resources of uranium for conventional reactors. The reason is that diffuse sources of uranium are very expensive to extract, both in terms of money and energy. As a result, using diffuse uranium for conventional reactors would massively reduce the EROI and affordability of the reactor. However, the situation is different with breeder reactors. Breeder reactors require only 0.7% of the uranium, as you pointed out. With breeder reactors, diffuse sources of uranium become energetically and financially feasible. Mining enough uranium for all the world’s electricity would require about 600 kilotonnes of granite per year, which is about 0.001% of worldwide iron ore mining. Of course it requires a lot of energy to extract the micrograms of uranium, but this is also plausible since a tonne of granite would yield massive amounts of energy. (I’m not going to do the math on energy costs here; I’m just repeating what I read in a journal article). Breeder reactors therefore increase the amount of uranium by a much larger factor than the 140x you indicate, because they open up additional sources of uranium which are diffuse but massive. Actually, molten salt reactors have all those benefits. Thorium is particularly well suited to them (in which case it’s also called the liquid fluoride thorium reactor) but you can run an MSR with uranium fuel. There is a documentary called “Into Eternity” about the first final storage facility currently being constructed in Finland. Ideally, such a facility would be built in Australia but try telling that to the Australians. If all goes well, the facility will receive nuclear waste till well into the 22nd century. But who knows what the 22nd century will bring? That’s the main problem I see (plus proliferation). Having to handle complex technical problems for a very long period of time. But if we’re already committed to the waste problem for such a long time into the future then we might as well go ahead and squeeze everything (within reason) out of it. AIUI the waste problem is greatly inflated by not reprocessing, and thus burying plutonium and other actinides. Bury the true waste, the fission products, and you’re looking at centuries not 100,000 years. Among the daughter products are technetium-99 and zirconium-93 with half-lives of 213,000 and 1.5 million years, respectively. Their yields from U-235 are 6.1% and 6.35% (near peak of products curve), while for Pu-239 it’s 3.8% and 6.2%, and for U-233 (thorium product) it’s 7.0% and 4.9%. So there are high-yield, long-decay fission products no matter what. Of course long decay also means less active, so there is a trade. Still, if you look at a timeline chart, once you remove the actinides, technetium is the dominant source of radiation, and is very long-lived. Let me know if you find a good resource that puts the long-term radioactivity in context with respect to short-term. There are clearly high-yield long-term products, but how important are these? It seems to me that, the more radioactive a substance, the more potential energy it has. The challenge would be extracting that energy. Hotter substances should be viewed as potential energy sources, and ones too cool to be useful as energy sources are hopefully also too cool to worry about more than other forms of industrial waste. Is anybody considering the possibility of using these radioisotopes in RTGs or the like? Sure, the energy density isn’t going to compare with fissile material, but my gut tells me it’s still going to be pretty dense. It also seems to me that, realistically, the energy used with waste disposal should be included in the EEROI for nuclear, just as the energy we’ll need to clean up the atmosphere should be used in the EEROI for petrochemical fuels, just as the energy needed to pour the concrete for a dam should be used for hydroelectric’s EEROI. I think such an equation would show solar to be far and away the cheapest form of energy currently available. Unfortunately not. You must bear in mind that the volumes of nuclear fuel and nuclear waste are _extremely_ small. They wouldn’t generate much energy using just decay heat. You’d need to use the Cesium-137 and Strontium-90, since longer-lived isotopes aren’t hot enough to generate much energy and shorter-lived isotopes (iodine-131) won’t last more than a few weeks. If you added the entire world inventory of Sr-90 and Cs-137, it would easily fit under my desk. I’m not going to do the math here, but I’d be surprised if all the waste in the world were enough to heat a few dozen decent-sized buildings. And that amount is exponentially decaying, so you’d need to keep generating waste just to keep heating those dozen buildings. The Soviets used the Sr-90 from their waste to power strobe lights using RTGs in remote lighthouses. They managed to power a few lighthouses, but that’s it. It would be tricky to calculate the EROI because different waste disposal schemes use very different amounts of energy. One plausible scheme for disposing of wastes would be to vitrify it (mix it with SiO2 and turn it into glass) then dump the glass bricks in a trench in the ocean. This would require 0.00000001% (I’m guesstimating here) of the energy which was gained from fissioning the uranium. Technetium 99 is a soft beta emitter with a long half-life, and if incorporated into vitrified waste would pose no threat to human health. Likewise with zirconium 93, which has an even far longer half-life. It’s a non-issue. Sure, you could isolate and transmute it, but I doubt that the economics would make sense given its relative innocuousness. Social and political problems of accepting the risks of nuclear energy will resolve themselves if people are cold, hungry, and broke because of shortages of fossil fuels. What I don’t understand is why you think that nuclear will not scale to a fossil fuel level. In the US we get 20% of our electricity from nuclear. France gets 70%. Clearly, nuclear can scale up. I understand that nuclear cannot provide liquid transportation fuels, but, coal can be turned into liquid transportation fuel by use of well established scalable technology, as can natural gas. If fossil fuel prices go up because of scarcity, the market reaction will be to use less FF for electricity, and substitute nuclear for electricity, and increase investment in CTL and GTL. I think you missed the flaw that makes it unscalable: It can scale up in the very short term, but at the cost of eating through the U-235 at an increased rate. Time frame is largely an economic issue. I was concerned with scale as an engineering concept. Your concern with U 235 stocks is noted, but the real problem is that right now the US does not recycle used fuel elements. Fuel rods must be currently be replaced after a couple of years of use. At that time they still have about 90% of their original amount of fissionable material. Used fuel rods can be recycled, which is done in France. This would provide a large quick goose to fuel availability. I have been careful not to say that nuclear can’t scale (though only for short duration by conventional means). My on-balance assessment is trying to get at whether or not it will. The latter is clearly more opinion than science, and I could be flat-out wrong. Tom – up thread I developed my technology evolution thoughts regarding the fact that inventors and engineers can and will turn atomic fission into a virtually inexhaustible resource if allowed to do so. There are no physical barriers to gradually developing technology that puts an ever larger share of our natural endowment of U-235, Th-232, and Pu-239 to beneficial use for mankind. I am also convinced that the process will eventually happen no matter what opinions we hold today. People are endowed with a survival instinct, the ability to think, and the ability to communicate that no other creature has. If stimulated by enough need, they will overcome the artificially raised barriers. However, I hope that we are smart enough to recognize that it would be a lot more pleasant to develop abundant nuclear fission energy NOW while we still have reasonably abundant fossil fuel energy to allow a smoother transition that does not force billions of people into fuel poverty before we finally get motivated to use more fission. In my not so humble opinion (after all, I am a former submarine officer – few of us are humble people) we have a tremendous opportunity that is being hampered by the fears installed by the existing energy industry establishment. They LIKE IT when most people think of energy as something that is scarce and expensive. It is far more profitable to produce as much oil as possible every year for a market willing to pay $100 per barrel than to produce the same amount of oil and sell it for $50 or $20 per barrel. The current price of nuclear fuel, which is just another source of the same kind of heat that you get from hydrocarbon combustion, is about $0.65 per MMBTU. “Cheap natural gas” that oil companies sell runs for $3.00 per MMBTU in the US and about $15.00 per MMBTU in the form of LNG that is replacing nuclear fission in Japan right now. Do you think that the oil and gas companies like the idea of that kind of competition? Coal is another topic – it is almost exclusively used in producing electricity and it sells for about $2.00 per MMBTU at the mine but transporting it can cost as much as $3.00 – $4.00 per MMBTU depending on the distance traveled. Naturally, the cost of the fuel for nuclear reactors is impressively cheap. But the fuel is not the dominant cost in the case of nuclear plants. The total levelized cost of nuclear is extremely close to—if not slightly higher than—coal and natural gas generation (see http://en.wikipedia.org/wiki/Economics_of_new_nuclear_power_plants for a synopsis). So using the fuel cost to imply that nuclear is “dirt” cheap is not practical. Tom – you are using levelized cost projections, not reality. We have 104 operating plants. Nearly all of them are fully amortized and nearly all of them still have more than 20 years of life remaining. The average “all in” operations and maintenance cost is 2.13 cents per kilowatt hour. I have the same models that some use for their LCOE estimates. You are the guy who likes to do the math, but you know as well as I do that the initial assumptions matter a great deal for the final numbers for any equation. The assumptions made in studies like the one conducted by MIT include higher financing costs for nuclear, very low fuel inflation rates for gas and coal, high overnight costs for nuclear with no computation of the potential reductions due to series manufacture, and capacity factors for gas plants that are never achieved in real life. We have not really tried to manufacture nuclear plants with any kind of cost or lean six sigma type quality program. Assuming that nuclear plant cost behavior will take the same trajectory as it did during the first Atomic Age assumes that all nukes are stupid and cannot learn lessons from the past. Agreed with Rod. Great post very interesting, if I may say so. Isn’t only about $1000/kW or so of the projected costs of a new nuclear plant such as the AP1000 actually needed to produce the (nth) plant? If you think 104 fully amortised operating plants that can produce electricity really cheaply is all we need going forward then you’re right. However, if you think we need to build new plants to replace retiring plants as well as grow nuclear substantially beyond the 6% contribution it currently makes to world energy supply then you need to make projections on how much it will cost to build new ones, and I’d like to see how much the nth one actually costs before making any projections of the (n+1)th one. Olkiluoto, for example, was supposed to herald a new era of nuclear power plant construction, and so far it looks uncomfortably like a continuation of the old one. Centralized, expensive, hi-tech facilities requiring a highly functional, stable society — yes, um, I don’t think that sort of set-up is feasible or realistic in the financially imploding, politically dysfunctional, and geopolitically unstable world of today. Apparently some countries are not allowed to construct and operate such facilities. We seem to have an issue with trusting them when they say it’s for peaceful purposes only. The idea that nuclear power plants are huge, central station behemoths is a myth that is reinforced by people that want to paint a competitor into a niche corner of the energy market. As Tom pointed out clearly at the very beginning of his post, fission is “just” another source of heat. The problem I have with the word “just” is that heat is a product for which human beings spend about $6 trillion per year in the form of combustible hydrocarbons. The people that sell, transport, finance, store, and build machines that use that particular form of heat do not like the idea of competing with a far more energy dense fuel that does not even need a smokestack to be a part of the design. France gets 70%. Clearly, nuclear can scale up. but it safe? are you ready to distroy everything by scale up the nuclear power? I applaud your non-commital answer. When discussing energy concerns, I’m suspicious of those who have a cut-and-dried solution. As someone working at a nuclear plant, I’ve been more interested in public perceptions, from the general citizen right through the “science expert” at major media outlets. What I’ve found is that very few outside the security fence understand these huge machines, so making decisions about them tends to be more like pcking a curtain on Let’s Make A Deal than any reasonable analysis. (And the decision could reasonably go either way.) To help folks understand what goes on at an atomic fun factory, I wrote “Rad Decision”, a thriller novel that covers the people, politics and technology. It is available free online – just Google the title or go to http://RadDecision.blogspot.com ..The book’s media profile is quite low but there are many positive reivews at the homepage. Thanks for this, I think its great. At best this is a way to get us off of Coal as a base load generation, like it currently is used for. I still believe that distributed Solar PV on roof tops is a good peak way for people to be somewhat self reliant from outages and grid issues. Replacing gasoline/diesel in vehicles is the tough nut without a better battery storage for less money. The battery in the new high end Tesla S is 85kWh but cost a great deal of money. When we get to the 100kWh battery for $10K, then we should have a new game. Until then efficient hybrids are going to be the best bridge option. That may be a bridge to nowhere. Batteries have gotten a lot of research without much improvement. They’re already using lithium, the lightest metal, though beryllium and boron would seem to have better valence/mass ratios. Ideal would be a carbon-hydrogen-air battery, aka fuel cell, combining energy density and electrochemical efficiency with the cheat of airborne oxidizer, but we’re not racing to those. I think much more extended public transit, and/or synfuels, would be safer bets. Frankly, I don’t at all share your pessimism. A couple decades ago, the only batteries you’d see in cars, including electric vehicles, were lead-acid, and the only other batteries you’d ever see were disposable alkaline and a smattering of rechargeable NiCads and single-special-use lithiums. A decade ago, rechargeable lithiums were just barely cheap enough to use in high-end electronics and rich-person technogeek-friendly cars. Aside from the novelties, batteries were hardly different than they had been for decades. And today? You can’t find a major brand car model that isn’t offered with a hybrid option; there’s a smattering of all- or mostly-electric mainstream cars on the market; and the batteries in something like the iPad border on magic. I mean, the thing has a 10-plus-hour charge and is as thick as a couple dozen sheets of paper, with a lifetime of an insane number of recharge cycles. And there’s no signs of slowing down just yet. Will we see Steve’s 100 kWh $10,000 battery sometime in the next couple years? No. Not a chance. But, barring economic catastrophe, it seems to me that it’s an entirely reasonable expectation for 2020 or thereabouts. After all, it’s the R&D and production scale that’s still the problem, not the physics or materials cost. You could have the 100 kWh battery today if you wanted — just not for $10,000. Scale? There are 75 million new personal-use vehicles sold every year at present. Tesla’s battery weighs 990 pounds. How much lithium is in there? How many years’ worth of lithium exist on Earth, if one projects these basic facts? Running a microchip and video screen is a rather different task from propelling a 4,000-pound object at 25-75 mph. According to the pffft of all knowledge, global lithium production is 25,000 tonnes and minimg reserves total 13,000,000 tonnes. That’s traditional, easy-to-get-at sources; its crustal prevalence is about the same as nickel and lead, and there’s a quarter of a trillion tonnes in seawater. It works out to about 5 g metallic lithium per kWh battery capacity. The Tesla has a 56 kWh battery, or about 11 g of lithium…or over 2 billion cars / year if we were to dedicate all current lithium production. Four years of production gives us enough cars for every human being on the planet, and then some, and we’ve got enough reserves for a half-century of production at current rates. I don’t know about you, but I don’t plan on losing sleep at night about running out of lithium. I’m going to terminate the lithium tangent. But note the math mistake: a 56 kWh battery needs 280 g of lithium, not 11 g. I have not checked that the input info is correct, just noticed the math error. Seriously, though, very informative blog postings. I don’t understand why everyone gets so upset about saying “nukular”. A nation that includes “Warshington” state, “Noter Dame” University, and the Boston “Seltics” shouldn’t be so stuck up about proper pronunciation. Indeed. I don’t think of myself as having an accent, but I will admit that, as with (I’m sure) many of Tom’s (Northern California) students, I’ve spent far more hours in the LIEbrie than in the LIE-ber-are-ee. Is that so much worse than a former president who was an engineer on a nuke sub in an even earlier life mispronounciating the word as “nukular”? I seem to recall that Teller and Eisenhower both used the same pronunciation, but I wouldn’t swear to it. There’s lots to criticize about Bush, Jr. (or any other public figure), and I’ve been more vocal in my criticism of him than many. But, though I say the word differently, I have no problem with the way he pronounces this particular word. I’ve switched and now pronounce it “nukular”. I prefer it that way. It rolls off the tongue so easily. Americans can’t even pronounce aluminium right, i wouldn’t worry about it too much. That’s because we have aluminum over here. B4 long, we’ll also invent lithum, beryllum, sodum, magnesum, all the way thru uranum. I’ve been advocating thorium, and think you’ve done a fine job here. Molten salt reactors definitely have some engineering left before they’re ready. It doesn’t seem to be unfeasible, but we can’t start building them tomorrow either. In the meantime, more conventional reactors would be a good transitional strategy. Fast reactors like the PRISM could play a significant role too. One nitpick: molten salt reactors are supposed to be pretty good at load following. The PRISM is designed to be pretty resistant to proliferation, since the fuel reprocessing is done inside the plant instead of transported elsewhere. Liquid thorium is probably even better, since it breeds just barely more U233 than it needs to continue, and fissions it all. Divert much U233 (or protactinium, or neutrons) and you’ll soon have to go begging for more startup fuel. A design that’s supposed to be even more proliferation-resistant is the DMSR, which is a once-through molten-salt design. Note: France operates a number of its pressurized-water reactors in load-following mode; Exelon operates boiling-water reactors in the Chicago area in load-following mode; granted that the PWRs in the current US fleet are reluctant to change power levels, but that’s a matter of specific design decisions that could have gone in a different direction. It’s not just that the fuel recycling in an IFR is done on-site. The pyroprocessing never separates actinides, so there’s no more danger of separating out plutonium than in regular spent fuel from light-water reactors (which also contains plutonium). Besides, in both cases the plutonium is no good for weapons. It’s far too contaminated with non-weapons-grade isotopes of plutonium. Contrary to uninformed but commonly-believed opinion, power reactors are NOT used to produce weapons-grade plutonium. It’s done in special reactors built for that purpose. It could be done in almost any reactor with special effort, but extracting it would still require an expensive aqueous reprocessing system. The use of one of the many small research reactors spread around the world at universities and elsewhere would be a far easier source of surreptitious plutonium production than a commercial power reactor. The main problem I see with nuclear power is radioactive waste. This might not be apparent now and might not become a problem in our lifetime, but it has the potential to make large areas of Earth uninhabitable for a long time. Even if all the spent fuel lying around in nuclear power plants all over the world is successfully stored in deep geological repositories (all over the world again, because every country or region will need their own storage site), some of it will resurface at some point. We’re talking about hundreds of thousands of years and the Earth’s crust can be very active in such a long period. Then again, if we do experience a fossil fuel crunch in the coming decades, I doubt that storing a significant part of our radioactive waste in deep repositories will even be possible. In that case, most of the waste will still be on the surface in fifty or hundred years, with fuel rod casings and storage pools happily decaying. [Are you able] to document your assertions? Document what? That the Earth’s crust is geologically active or that radioactive waste stays radioactive over extremely long, i.e. geologically relevant, periods of time? Both are facts and common knowledge. Look up tectonics and radioactive decay in Wikipedia for (basic) information about these topics. Definitely not. Nuclear waste is exponentially decaying and loses something like 99.99% of its radioactivity in the first 300 years. After that, the isotopes remaining are things like technetium-99, which is _very_ weakly radioactive (compared to the earlier wastes) and found in _extremely_ small quantities. Even if the repository started leaking, the result would be to raise the cancer rate in some downstream locale by 0.001%. Nobody without a geiger counter would ever notice. Since the waste is decaying exponentially, we will eventually reach a nuclear equilibrium in which the total amount of radioactivity will never increase despite continued nuclear power generation. Even then, the volume of waste would be very small. In other words, the maximum volume of waste which we could ever generate would not be enough to render even a small area uninhabitable after 300 years. 1. Locking the spent fuel in deep geological repositories is about the dumbest thing we could ever do. Breeder reactors can extract many times more energy out of it than has been derived from burning it the first time. Why on earth would any sane person store it in the ways proposed (most of which will make it quite hard to retrieve back)? 2. The more dangerous the waste, the less time it is dangerous for because it decays faster. The danger is way overblown. “Colorado, where much of the uranium is obtained, is a geologically active region, full of faults and fissures and mountains rising out of the prairie, and its surface rock contains about a billion tons of uranium. The radioactivity in this uranium is 20 times greater than the legal limit for Yucca Mountain, and it will take more than 13 billion years–not just a few hundred–for the radioactivity to drop by a factor of 10. Yet water that runs through, around, and over this radioactive rock is the source of the Colorado River, which is used for drinking water in much of the West, including Los Angeles and San Diego. And unlike the glass pellets that store the waste in Yucca Mountain, most of the uranium in the Colorado ground is water-soluble. Of course even if he’s right about the physics, the politics is another matter. It’s lucky that fast and liquid thorium reactors make a lot less waste, with a much shorter half-life. His argument seems to take a mountain range and drop concentration vs. distribution concerns on the ascent. The total radioactivity of the Fukushima inventory, diluted in the world’s oceans, might not hurt a fly either. That’s a general problem in several contexts. It is not the alpha/beta/gamma/neutron particles emitted by the nuclei, but the occasional tendency of said nuclei to travel in smoke/dust-sized clumps that, placed on skin or inside lungs, can invalidate any large-scale averaging. I’d be curious about “ocean harvesting” EROI for the same reason. Concentration matters. Thermodynamics puts a hard lower bound on the energy cost of extracting a dilute substance from whatever it’s dilute in, but the late John McCarthy somewhere calculates that this limit does not prohibit the energy-positive extraction of a single uranium atom from an Earth-sized planet in which it was the only one. The Tamada document I linked elsewhere in this thread deals with the experimental extraction of 1 kg of marine uranium and projects that a 1000-tonne-per-year scaleup would afford a per-joule uranium cost that turns out to be equivalent to $2.50-a-barrel petroleum. This suggests the EROI is at least many hundreds. If the linear-no-threshold hypothesis is correct, then concentration does not matter, only human exposure. If we took a quantity of radioactive material which would cause a 10% chance of cancer if ingested by one person (thus 0.1 person-deaths) and diluted it 100x and fed it to 100 people in equal amounts, it would still cause 0.1 person-deaths. This implies that the Colorado river would pose a _greater_ danger despite lower concentration, if the LNT is correct. If, on the other hand, the linear-no-threshold model is _not_ correct, then rad waste poses practically no danger. After 300 years, it has lost almost all its radioactivity. At that point a person would have to eat tons of it to get above the “threshold” necessary to cause any damage at all. That amount could not be caused by leakage. As a result, Muller’s analysis is correct. No matter what we assume, the radioactivity exposure from rad waste disposal is vastly less than that of the Colorado river. V. Smil has an excellent history of nuclear power development chapter in his new book “Energy Myths …”: how the PWR came to rule the industry, the first Comm. Ed Chicago plants in Illinois built cheaper than coal at ~$200/kWe ($918 today’s dollars), not a single new plant proposal licensed in the US under the NRC, etc. Obligatory Blinky to go with Homer’s nuke plant pic! 2. Due to the same melting of ice, sea levels will rise and inundate many locations. Aside from all that, we need to stop burning fuel in a hurry, whether we have the technology to replace it as an energy source, or not, because the ocean is acidifying, which is going to eliminate a major source of food for many people, and the background level of tropospheric ozone is inexorably rising, leading to significant reductions in annual agricultural yield and quality, as well as damaging trees, rendering them more susceptible to insects, disease, fungus, windthrow, winterkill and drought. The imminent collapse of both ecosystems – coral reefs in the oceans and trees in the forest – will ultimately pose an existential threat of widespread famine. Too bad most people don’t notice either one. Very nice blog, Dr. Murphy. That’s hardly a “climate change denier.” Since then he worked on the BEST study which validated climate science in a big way. Looks to me like he’s a careful scientist who thinks for himself. Also has fairly impressive credentials in general. I suspect he gets the basic physics pretty much right for his class at Berkeley. Not all reactors are water-cooled, by the way. There are GenIV designs cooled by salt, lead, helium, and sodium. You could build many of them in the high desert. Then don’t take his word. Look up the numbers yourself. With a little help from Google, it’s not that hard to confirm his claims. It great to have an opinion. Too bad you don’t know much. First of all, google ‘Taiwan radioactive apartments’. This and all the other statistically significant studies show that the failure to administer low level radiation is probably responsible for an incalculable number of unnecessary cancers as low level radiation is a cancer suppressor. Also, a molten salt reactor (MSR) could produce power for literally 10 cents on the dollar over ‘green’ alternatives. It is just an unfortunate decision of history, based on the falsehood of the linear no threshold theory that the light water reactor (LWR) was built instead of the MSR. The LWR wastes 95% of the fuel mined but it is not a reflection of nuclear’s failure as it is the success of the fossil fuel interests to sabotage the awesome potential of the MSR. Just think, just by circulating salt through a heat exchanger, a single plant could power the state of California and the fuel needed could be mined by a single person with a pick axe. In contrast, it would take an area the size of a great lake to panhandle for the pitiful amount of energy from passive sources. Okay, class. Normally I instantly reject rude comments, no matter what the content. Perhaps I should have done this here as well, always running the risk that I am accused of rejecting disagreeable ideas, when mostly it’s due to uncivil behavior clashing with the DtM discussion policy. Often the vitriolic attitude is paired with hyperbolic claims. Here, we have claims that A) MSR thorium can be 10 times cheaper than renewables (implying about 5 times cheaper than fossil fuel electricity—do I believe this? ); B) a single MSR plant could power California (average 30 GW of electricity); and C) a single person with a pick axe could obtain the fuel. Work the numbers on the last and you’ll discover that the person would need to produce 100 kg per day. Sounds like a challenge: find a person who can single-handedly extract that much thorium from the ground per day (day after day). Gee, it seems so easy. Part of the point of my replying here is so that contributors can understand that if I suppress a comment, it more often has to do with style than substance. In short, stay civil, stay short, stay on topic, stay away from back-and-forth spats. Actually, mr. Murphy, although Joe has used a possibly rude approach, his statements A, B, and C are not as faulty as they seem. A) I recall that a proposal was floated back in the 1950’s to build a 100 GW MSR for the purpose of hydrogen production for lquid fuel making. (can’t seem to find the pagelink) Such a plant could indeed be used to supply 30 GW of electrical power. B) Since thorium could probably be mined for $10 per pound, and a very large scale MST (100GW thermal) would have a tiny O&M cost, I think it is not so ridiculous to assume a ten-fold reduction in levelized energy cost compared to renewables. C) Finally: mining the equivalent of 100 kg of fertile material per day (assuming that is the needed amount) will indeed be a stretch for a single person. But I’m comfortable with this exageration, the point being that the mining effort would effectively be insignificant. I’ve wondered at the coincidence of the lack of nuclear power expansion after the publication of John McPhee’s 1973 profile of Ted Taylor, THE CURVE OF BINDING ENERGY. Taylor was a weapons designer at Los Alamos and was credited with designing the largest fission bomb ever tested by the US. The focus of the book is Taylor’s campaign to bring attention to the poor standards for safeguarding bomb capable materials in the supply and processing chain of nuclear fuels. In the discussions that went on at the time they referred to the lost fissionable materials as MUF (materials unaccounted for). The MUF was expressed in tons. The business types were saying that even if someone got hold of some plutonium they would need a Manhattan Project to make a bomb. But there was Ted Taylor who actually knew how to make a bomb saying, “no it’s not that hard.” I highly recommend this book to anyone that loves mad scientists – Taylor also designed the Orion spacecraft that was powered by atomic bombs. For the punch line Taylor describes as well as possible, without going classified, what it would take to make a homemade atomic bomb including how big it would have to be. The statistics on MUF make the current political theater regarding Iranian nuclear materials production seem rather foolish. Maybe it’s the nucular material they’re trying to produce. An episode of Lou Grant was based on that. A reporter talked to a bomb builder who said it’s not that hard to build a bomb but it’s impossible to the plutonium. Then the reporter talked to a plutonium guy who said, yeah, we’ve lost a lot of plutonium but it doesn’t matter because it’s impossible for someone to build a bomb. Tom, on balance I agree with your assessment and for years I was slightly on the pro-nuclear side of the fence. There is however one argument that has tipped the scales for me in the other direction: limits to growth. In a declining global economy (as a consequence of peak oil), the financial and organizational resources required to keep nuclear plants well maintained are going to be scarce, and increasingly corners will be cut. Ignoring accidents (which you’re right are statistically rare, at least today), at some point the whole plant has to be decommissioned and its fuel and parts stored as waste. This requires vast knowledge, money, resources, and organization. The nuclear industry is old: most of its experts are near retirement. If we do partially get stuck in the energy trap, but have tried to go the nuclear route anyway, in a few decades we might be left with a bunch of plants to decommission in a dysfunctional economy with few experts and no resources around to get the job done. This isn’t a problem with any other type of power plant—you can to a first approximation just shut down a coal plant and walk away. Of course, we may not get stuck in an energy trap or face a slow economic collapse, but as you’ve pointed it would be unwise to not seriously plan for it. As I’ve heard it argued concisely: nuclear power is incompatible with hard times. If newer plants use passive designs so they don’t melt down, I wouldn’t think they would be worse than abandoned chemical plants with waste pits, not to mention the vast amounts of land that will be striped for tar oils. So if there is a reasonable chance to escape or ameliorate an energy trap I think it is a reasonable option. The biodiversity around Chernobyl has apparently increased after reduced human habitation. Indeed the biodiversity around Chernobyl has increased; not unexpected when you remove the human hunters, farmers and their pesticides, and all road traffic. Paul: Apropos to Tom’s short but apposite paragraph, Societal Factors. I find your points to be pertinent. People are the major threat to biodiversity. People avoid the Chernobyl region out of fear of the radiation, which allows plants and animals to thrive there much live they thrive in the DMZ between the Koreas. We are reading that old people are moving back to their places in Fukishima with the rationale that they will die soon anyway, so what the hell (very sensible, those Japanese–Most of US health care dollars are spent in the last few months of life, etc.). So, a world in which nuclear power ramps up will be one with more Chernoblys and Fukishimas. Old folks homes could locate in these areas, perhaps. A growth industry, unless the age distribution shifts toward the young. The concern isn’t primarily meltdowns—it’s the hazards that remain at the site that need to be safely dealt with after the plant is shut down. You’re right that chemical plants have similar problems, but the expertise and resources required are unlikely to be as constrained (they’re generally less complex, less costly, and less dangerous to deal with than nuclear). Anyway, that’s an argument for phasing out the most hazardous chemical production as well, not an argument for nuclear. Uhm, so is most life on earth, if you’re positing that degree of breakdown. World population has grown so far beyond what could be supported absent the machinery and workings of technological civilization that any serious breakdown will become very messy very quickly. Zero survival isn’t implausible, because it might not be possible even for bands of hearty (& ruthless) survivors to revert to hunting and gathering. The world would be stripped of anything to hunt or gather by the desperate hordes of temporary survivors who lacked the consideration to lay down and die for the sake of a few ultimate survivors. Survival of the fittest only works if there’s an environment left in which survival is possible. I don’t consider that scenario likely, but neither can I dismiss it out of hand. Nor can I completely dismiss the argument from the pro-nuke camp that rapid development of nuclear energy is the only realistic option we have to keep the machinery working long enough to (hopefully) unwind our current precarious position. I think there are other options, but against the prospect of a world stripped of life above weeds and cockroaches, fears about one of our illiterate descendents wandering into the ruins of abandoned nuclear power plant and incurring a lethal dose of radiation — well they look pretty silly. I agree that nuclear fission energy is incompatible with hard times, but for a different reason. If we recognize and use the vast power with which the earth is endowed in the form of U-235, Th-232, and Pu-239 there should not be any hard times. I am not a pollyanna and know that there will always be poor people among us, but the general level of prosperity should be ever rising, not falling as you so pessimistically portray. We have the power; we need to use it well. Certainty about the future is the fastest route to losing my trust. And while much of what I write points out the possibility of failure, my intent is to open up the range of futures we are willing to entertain—offsetting what I perceive to be a prevailing bias. Only by recognizing our danger can we make smart decisions soon enough to maximize the chances that we don’t fail. I broadly agree with what you say. I think that technologically a good case can be made that nuclear can scale up, but then LWR:s should be seen only as a temporary solution to be followed by breeders (and/or converters) ASAP. The uranium and thorium supply is not a problem especially not with breeders. They improve to fuel efficiency by perhaps two orders of magnitude so the ore can be much more expensive before it has any relevance for production costs. (Even in case of LWR:s the supply is not fixed. The link you provided mentions that resources increased 15% in two years due to increased exploration.) The challenge is mainly political. As for costs, I think you have to be a bit more careful in assesing what part of the costs are technology specific and what parts are costs imposed from the outside. When it comes to fossil fuels many accept routinely much larger risks than those associated even with the most unsafe nuclear reactors. Nuclear costs relative to options are very much dependent on whether risks are regulated according to same principles. Today they are not. No coal power plant would be running if they would have to limit the release of radioactive substances in the same way as NPPs.Furthermore, there is no single costs for nuclear. In some countries nuclear is much cheaper than in US. There is a world of difference in regulators facilitating the construction of safe nuclear power and regulators blocking the construction of new NPPs (which for an outsider appears to be a speciality of NRC). You have earlier discussed the massive problems wind and solar have with storage. If the society is to decarbonize I think it is very hard to see alternative to massive nuclear buildup. Tom, I’ll admit to disappointment on this article, not just from your non-committal stance (which you admit to and I understand), but mainly because the article doesn’t handle a lot of math, but more of the “fuzzier” issues like safety. Basically the article shows that current nuclear technology won’t work, because we would burn through uranium too quickly. You then mention your not ready to do the full math on alternatives like thorium. I think that’s fair enough, but it seems like a waste of an article if we aren’t going to really look at the modern possibilities of new nuclear reactors. That said Tom did make it clear that New-clear is not a renewable resource. It operates very similar to Coal is the point he made. I wish though he had delved into the costs, material and space needs issues. For instance a new 1000 MW reactor is a $10 Billion investment. This number continues to rise as new flaws and failure modes continue to arise. Despite what the Thorium people will tell you this is not a unreasonable number for their option as well. If you want 1000,000 MW, roughly 1/20th of our global needs, that would cost $10 Trillion. Just for reactors. Not to mention the cooling needs, transmission needs, waste needs, etc. Also one of the lessons of Fukushima is to have a reasonable exclusion zone in place before hand. About 4-5 KM’s all around the reactor. About 20 sqkm or rougly 5000 acres. Another lesson is to not cluster plants together. So some considereable land needs will have to be met. Once all these numbers are crunched how cost competitive will nuclear be with passive, safe and minimal failure mode Solar/Wind. The question of whether modern nuclear options can be considered renewable is a big question to me. After getting into energy research, I soon learned that current nuclear technology could not sustain the world for very long. That’s when I started to learn about alternatives like thorium. At first, I pushed them aside. After all, why switch from one nonrenewable source to another when we have renewable options like solar? But a few papers have made an interesting point. Renewable isn’t truly renewable either, the sun will give out eventually. So any energy source that would sustain us over a similar timeframe might as well be renewable. They then make the claim that thorium based reactors with its abundancy and potential high efficiency could provide power on that timescale. Tom, I am really interested to see your take on that claim when you do your thorium research. That [solar isn’t forever renewable] is not much of a point. The sun is not comparable to mined Uranium. There are orders of magnitude differences. What one means with renewable is the the energy is free, no price escalator and no meaningful problematic byproducts are produced. For instance Tom mentioned the cooling and waste needs of a Nuclear plant. I’m not opposed to Nuclear. Bit of a Thorium supporter myself. But as an engineer I sense the Thorium boosters are on more than a little ‘Hopium’ in Toms memorable characterization. IMHO they are doing a massive disservice to Thorium research by not actively focusing on the unknown unknowns in military speak. This is non-trivial technology. One always gets nervous when multiple bleeding edge technologies are necessary to make a project successful. Despite what the Thorium boosters might blithely claim the vast majority of materials and safety research to make something like LFTR safely operational are still ahead of us. If some one asked me to guess I would say we are at a 1% concept design phase. It is not even clear a path to safe 40 years type operation life is available. Corrosive salt at 800C and fluorine gas at 600C are not safety enhancing substances, especially over 40 years. We don’t know how to do this right now, there are real physical limitations when dealing with such substances. Without dropping most of our present Nuclear safety systems, as the Thorium supporters urge us to, the safe economic viability of this technology is very very questionable. My problems with unreliables (what some call renewables) are that they are diffuse and require huge collectors to produce meaningful amounts of energy and that their basic input is controlled by the weather, not by people. Travis: you and TheoA are right: this was something of a punt. All the same, how many people understand that scaling up nuclear-as-usual is not a scalable option: that we need a new regime to make it pan out? It was a surprise to me when I learned it. And, it may be fair to say that society as a whole takes the “punt” approach to nuclear. The political football may find a hard time settling down to something real (in time to matter). You seem to have “learned” it by asking what would happen if, instantly, there were ~20 power reactors for every one that now exists, without any similar instant increase in known cheap uranium reserves. But even with dollar-a-barrel (oil equivalent) uranium those reserves have been increasing much faster than consumption. You can track this by looking up past editions of the biennial IAEA “Red Book”. The energy density of the Alberta tarsands, with respect to tar combustion, is illuminating: it’s about the same as the CANDU-relative energy density of average continental surface. A sufficient price rise would make ordinary rock into CANDU fuel ore, at the cost of taking something like 20 percent of the output of the CANDU fleet to pulverize. As I understand it, nuclear fuel exploration and mining is a business that is run by the numbers, namely by looking at the consumption of nuclear fuels in the future and the present capability of existing mines. And because nuclear plants are built and run in a very predictable way, it is relatively easy for mining companies to predict when to build new mines. In fact, the “Red Book” shows that miners will easily be able to triple uranium production in the next 30 years, in order to accommodate the current rather modest nuclear power ambition of the world’s peoples. So I think it is a mistake to assume that there is not enough nuclear fuel available to scale-up nuclear power by looking only at *current* figures from exploration and mining. I think it is much safer to assume that exploration, mining and nuclear technological development *will* be able to accomodate *any* needed level of new nuclear build for the next thousands of years at minimum. For example, if tomorrow governments decide that in the next 30 years, the world nuclear fleet should be multiplied by ten from today’s size, then I think it is safe to say that exploration, mining and technology development (i.e. Gen IV reactors) *will* be realised relatively easily and at reasonable (= very low) cost by the private sector, without subsidy. From my (admittedly cursory) research I conclude that nuclear energy is the only option that truly is *completely* a matter of ambition and political will only. It suffers from *none* of the physical limits of the other sources, such as safety, cost, convenience, polution, land-use limits, etc, while the limits for all other sources are plain to see, as has already been explained by mr. Murphy on this excellent website. I trust Mr. Murphy will develop his series on nuclear energy by touching on all the key points. I hazard to guess – judging from this most recent posting – that he will be quite pleasantly surprised by the potential of nuclear energy as he delves further into the fascinating subject matter. Or am I mistaken? Note that I assumed a doubling or tripling of uranium reserves when I concluded that full-scale nuclear only provides a few decades. Tripling the current trickle of uranium (6% of world energy) by 2030 is not actually very impressive, next to the scale of the problem. I think it is much safer to assume that exploration, mining and nuclear technological development *will* be able to accomodate *any* needed level of new nuclear build for the next thousands of years at minimum. runs 180° opposite my philosophy: there is nothing more dangerous (opposite of safe), in my mind, than assuming any such thing. Complacency breeds inaction. Dangerous path. Ironically, we have the saying that “there’s safety in numbers.” Many of my calculations send the opposite message. 180°! I was being crass trying to keep it compact. I don’t disagree with you I think, so I want to clarify if I may.. I certainly didn’t mean to imply that nuclear safety was of no concern, only that nuclear safety can be provided at low cost in terms of ct/kWh. When uranium becomes expensive enough, perhaps around 2050, then commercial breeder and thorium reactors will turn out to be relatively easy to build, compared to the alternatives at the same or better cost/kWh, safety and environmental performance. It will mean that nuclear power can be relied upon heavily for thousands of years, assuming a nuclear renaissance. I forgot to mention another thing. Tom kinda mentioned this item when he said a stable long term society is needed for Nuclear. But I wish he had held our heads and stuck it into the dirt WRT what that implies. The solution has to be global. Everyone will get their hands on it. How comfortable would be be with say 5 Thorium plants in Somalia. Or a couple of breeder reactors in Afghanistan. What if we built 15 plants in Nigeria and the country imploded with 20,000 tonnes of waste fuel rods stuck in cooling pools. This is the future all the Nuclear advocates are leading us towards when we are not even comfortable with India having nuclear material and Pakistan terrifies us. Just potential for a series of dirty bombs to make large chunks of the planet unsafe for humans would be a possible nightmare. Lot of terror in that future. Contrast that to say 1 Million C-Si, CdTe or CIGS panels going missing in Afghanistan. Would we even care. I think you’re right, Theo, and it’s a point few nuclear proponents acknowledge: This technology cries out for effective world government. Personally, I think there’s as much hope and promise as danger in that fact. But, then, I think “nations” are dangerous fictions. The economics of nuclear energy are so favorable that there is more than enough money for a solid world-wide materials monitoring system (such as is done now already). Besides, even the Dalai Lama has stated that nuclear power should be built out. He even said that *during* his visit to the Fukushima disaster area! Also I would quibble about that economic argument. For ‘New’ reactors the numbers are more ambiguous. The Florida Levy county plants are coming in at about $12 Billion a piece for all site and non-site costs. And we have not even begun yet. Again I wish Tom had attacked this issue more deeply in the math portion. 🙂 I have a feeling this Nuclear cost issue will keep haunting us. Not sure what I’m supposed to say about the Dalai Lama. What are his engineering qualifications? The only reason the AP1000 nuclear power plant was even designed was because the designers wanted to create a power plant that could be built for $1000/kW, as opposed to the $1500/kW of it’s predecessor. I think it is unwise to assume that this goal will not be reached, since it would mean that the whole development effort of the AP1000 was fundamentally mistaken, which is unlikely to say the least. The people behind such an enterprise are not that stupid. I think it is much wiser to look for other reasons why the plants are so expensive, namely: irrational fear, political opposition, and the learning effect. I for one am confident that if, say 5 or more AP1000 are built in the course of 10 years, then the nth plant will get close to the target $1000/kW. That’s how it went in France with their nuclear program, and it is how it will go for the AP1000. When judging nuclear costs, it is essential to look at the details and seperate political costs from physical costs, otherwise a wrong understanding will develop IMHO. Nuclear would have been the way to go but only if we had had the collective wisdom to not put ourselves in the situation we are already in. It does not make any difference in its current conventional form, and it would buy a few millenia of electricity (with no growth) if breeders were used. But had the task at hand been 10 times smaller (or even smaller) than it is right now instead of going to become 10 times bigger in the near future, we could have bought ourselves a lot of time, a good portion of which we would have had liquid fuels too because we would not have burnt the oil at the same insane rate. Time that we could have used to figure out a truly long-term solution to the energy problem if we want to live on more than sun light flows. Of course, if such exists exists to begin with, which seems not to be the case as of now. Too late at this point though – I don’t see us capable of building up nuclear at anywhere close to the necessary rate once the brownouts and blackouts begin (without even considering the liquid fuel problem). It will have to be breeder reactors if it it to make a difference, but those are not a very well established technology because they have been suppressed for so long and it will take decades to build the plans and more importantly to train the people who can build and operate them (where exactly are the nuclear engineers necessary to operate all those plants going to appear from on a short notice?). No, it won’t take decades to build breeders. GE has offered to build PRISMs for the UK immediately. The S-PRISM is a molten Sodium cooled fast reactor. I suspect past experience with this particular design option is holding back the UK government. The UK government is planning to use it to burn its Plutonium not for its economic viability. Even GE is not certain of its economic viability. The situation is so tenuous that GE/Hitachi will build an entire test reactor near Savannah to demonstrate safe reliable operation. If “the situation is so tenuous” then GE wouldn’t have guaranteed the UK government that the PRISMs will work as advertised. Major companies don’t go out on a limb like that unless they’re sure of their product. As for Britain’s earlier experiences with breeders, they never built them like the PRISM and the EBR-II that was the PRISM’s model (which ran for over 30 years). That is just defeatism. There is plenty of time to train new engineers and build new nuclear power plants. Within 10 or 20 years, the nuclear industry could be completely revitalised. As an engineer with still some experience teaching at tech university, I have no doubt about this. You state that ‘uneducated martyrs’ are easy to find but suicidal nuclear technicians are not. This is not actually supported by actual research into the backgrounds and psychologies of suicide bombers. “Educated, middle class, with an engineering background” is actually a very typical description of a suicide bomber. The notion of an ignorant, desperate peasant is a comfortable political myth that serves both the left (“They have no prospects in life”) and the right (“They are mindless barbarians”). The reason I think that U-233 is considered less of a risk is that the prolific, characteristically high energy radiation from U-232 would make a device using it much easier to detect, especially using port-side radiation detectors. U-235 and Pu-239 devices cannot be reliably differentiated from harmless items by radiation detection alone. Have appreciated your works on these “alternatives”. I don’t believe any of them except passive solar would exist without the fossil fuel base. Solar and wind capturing devices are not alternative energy sources. They are extensions of the fossil fuel supply. There is an illusion of looking at the trees and not the forest in the “Renewable” energy world. Not seeing the systems, machineries, fossil fuel uses and environmental assaults that create the devices to capture the sun, wind and biofuels allows myopia and false claims. ERoEI is only a part of the the equation. Each of these processes and machines may only add a miniscule amount of energy to the final component of solar or wind devices. How else would we do it? There is always the old way. Who of us will go down in the mine first? [edited:] John, I read your web pages, and while I can’t have an extensive debate with you here, I’ll touch on my reasons. You claim that solar power has a fossil fuel subsidy. That is only partly true, however. Only the _first_ generation of solar plants would have a “coal subsidy”. Any subsequent power plants would have a “solar subsidy”. This is because we build anything using the PRIOR energy source. Of course, this assumes that we transition from coal to solar in one feel swoop. What really would happen, is that the first solar plant would have a 100% coal subsidy for its construction, then each additional solar plant would have a declining coal subsidy and increasing solar subsidy, until the coal subsidy reached zero. Look at it this way. The energy for early industrialism came from British coal, and it “subsidized” the subsequent energy sources. Does that mean we can never transition away from British coal? Does that mean all technology is just a British coal extender? Why didn’t civilization collapse as British coal declined? Here is another example. The initial metals for early industrialism were smelted using charcoal, from WOOD. Thus coal had a “charcoal subsidy”. Does it _still_ have a charcoal subsidy? What fraction of energy embedded in a modern coal plant is from charcoal? Fossil fuels may have been used to climb upwards to industrial civilization, but we can kick away the ladder. I’d like to add a few points to expand on your excellent discussion. a) Nuclear fuel can be bred in a way that does not contribute to proliferation concerns. The Integral Fast Reactor program designed a way to recycle metallic fuel, on site, which does not involve separation of pure Pu. With regard to waste, the IFR consumes the transuranics produced by light-water reactors. In fact, they NEED that material as “start charges” to get going. Hence, the most sensible way forward would be to expand Gen III LWRs first, and start building IFRs behind them using spent fuel as start-up fuel for the fast reactors. There is enough spent fuel and depleted U on hand now to theoretically power all U.S. energy needs for centuries. For more background see The Integral Fast Reactor: Summary for Policy Makers. The whole proliferation argument is specious anyway: the nations that would deploy the IFR (e.g. US or Britain) have nuclear weapons already, and history has shown that countries that want such weapons will do so regardless, and without connection to a civilian power program. b) Small modular reactors (~100MWe or less) promise to increase the speed of deployment and reduce costs significantly over practices of the first nuclear build (1970s-80s). These reactors will be manufactured in a mass production-line setting and transported whole. Smaller cores benefit from the physics of scaling and, therefore, add to intrinsic safety by making the problem of decay heat removal in a worst-case accident scenario much smaller (heat to be removed scales with the volume (L^3), but heat transfer capability varies with surface area (L^2)). Smaller reactors could support a wider range of applications, offering ability to match capacity to load near the point of demand, so could be used for things other than making electricity (e.g. district heating, process heat for industry). A “type certification” on a mass-produced reactor design would reduce cost, assuring safety while minimizing cost overhead per reactor due to regulation. More Here. c) Molten salt reactor design would be exceptionally well suited for load following due to the mobility of a liquid core that can automatically adjust reactivity with temperature (lower temperature -> increase fuel fissile density in core -> increase power; higher temperature -> decrease fuel density -> reduce power output). The liquid core operates at atmospheric pressure, and the uranium and thorium salts are chemically stable, further adding to intrinsic safety features. Greater intrinsic safety features imply costs to defend against failure modes (e.g. massive containment structure to prevent reactor steam explosion from escaping) could be reduced significantly. d) A huge social factor against nuclear power stems from fear of radiation, the belief that there is no such thing as a safe dose hence ANY accident scenario involving a leak poses unacceptable risk. This belief is, quite simply, wrong. Not the least of it because our bodies are radioactive already due to trace amounts of potassium-40, carbon-14 and uranium (average U.S. male has approx. 90 micrograms of U in the body), yet we don’t all drop dead. Life has evolved multiple ways to deal with cell damage, and no harm results to the organism provided the rate of damage is less than the rate of repair. Moreover significant evidence has been accumulated from observation of pathology rates in areas with significantly higher natural radiation background and from medical radiotherapy data. The conclusion is that current radiation standards are low by a factor of 1000 relative to what could be considered as high-as-reasonably safe doses. For more, a place to start is with this submission to a Committee of the British Parliament by Prof. Wade Allison: here. In short the fear of low-level radiation thanks to ignorance, misinformation and ridiculously tight standards, is completely at odds with scientific evidence. Stephen, I agree with almost everything you said. I don’t want to nitpick, but I do have two objections. With regard to the cost of small modular reactors. Their cost is speculated and unknown. Any cost figures are estimates and could change considerably. All throughout the 1990s, it was argued that smaller reactors like the AP600 and others would be far cheaper because of smaller decay heat problems and less need for complicated cooling systems. That turned out to be false. I realize that the modular designs you’re referring to are different but the cost estimates are still speculative. With regard to radiation fears being overblown. I definitely grant this. Concerns about storage of nuclear waste are HORRENDOUSLY, ABSURDLY overblown. Storing nuclear waste is basically a non-problem. However, you said “no harm results to the organism provided the rate of damage is less than the rate of repair”. This is arguable. Nobody actually knows. Some researchers speculate any amount of radiation can cause cancer (the “linear no-threshold” model), while others speculate that no damage occurs below some threshold. It would be impossible to test this. You would need a study with both random assignment, and millions of people. Otherwise the study could never separate out the 1-in-a-million cancer caused by small doses of radiation, from the vast sea of normal cancers that would occur anyway. Of course, the reason there is even a debate is because the risk is so small that it’s hard to measure. Due to increasing costs of production, a slowed demand for electricity, and fresh memories of disaster in Japan, production of nuclear power fell in 2011, according to the latest Vital Signs Online (VSO) report from the Worldwatch Institute. Despite reaching record levels the previous year, global installed nuclear capacity—the potential power generation from all existing plants—declined to 366.5 gigawatts (GW) in 2011, from 375.5 GW at the end of 2010. * Together, China, India, Iran, Pakistan, Russia, and South Korea have contributed around 5 GW of new installed capacity since the beginning of 2010. During this same period, nearly 11.5 GW of installed capacity has been shut down in France, Germany, Japan, and the United Kingdom. * Germany alone has taken around 8 GW of installed nuclear capacity offline this year. * Currently, 65 reactors are under construction around the world; however, 20 of these have been under construction for more than 20 years. * Construction on the first nuclear power plant to be built in France in 15 years has been delayed until 2016, and its projected cost has grown from €3.3 billion (Approximately USD 4.4 billion) to €6 billion (Approximately USD 8 billion). * The average age of decommissioned reactors worldwide has risen to 23 years. * In 2009, the U.S. Nuclear Regulatory Commission received 26 nuclear reactor permit applications, but only four of those sites have plans for construction. The radiation hormesis hypothesis is far from conclusive. For each study of hormesis there is a study of cell damage far exceeding what would be expected by the linear model for a low dose. If we are going to go nuclear the dose effects must be thoroughly studied beforehand. Forgive me if I missed something… Where is the accounting for the energy required to mine, transport and refine the nuclear fuels, getting them into a useful, fissionable state. It seems to me (and, no, I haven’t Done the Math 😉 that today’s nuclear programme significantly relies on a fossil-fuel subsidy to be viable. … in a low carbon economy, the indirect emissions from nuclear power, along with other low carbon technologies, would be substantially reduced. Section 7.2 gives references, many of them web-accessible. Sorry, it looks as if the Sustainable Development Commission has had some troubles with its British government client. That PDF can still, however, be found here. An excellent post by tmurphy, and I hope to see many followups to the nuclear thread over the coming months. I am particularly happy that he is researching the molten salt reactor, a machine that some of us energy activists believe has incredible potential for benefiting the economic system. Of course, such a machine does not yet exist in a form that is commercially viable, but that could change with an intensive national R&D program. The question is whether this technical pathway is worth pursuing with say $10 billion of the Public’s money. Imagine you are the President’s chief technical advisor, and on these matters of national security your opinion is going to become theirs. As tmurphy’s earlier analysis on Peak Oil has made clear ( https://dothemath.ucsd.edu/2011/11/peak-oil-perspective/ ), this is a particularly risky situation for our country, and despite the need to import petroleum for the past four decades, we have yet to successfully address its cost/scarcity or emission problem. So, what are we to do? Are the proven and theoretical advantages of the MSR approach enough to ensure the economic synthesis of a carbon-free liquid fuel replacement for gasoline, kerosene, and diesel? If so, how quickly can these reactors be built? Would you say our international partners’ interests are misplaced in intensively researching this possibility? Nuclear is the most environmental safe option to generate power supply. It’s also the most economic option in the long run. If all the safety measures are put in practice, nuclear option is also most safe to the people working in the plant and the communities living around a nuclear plant. Tom has put an excellent technical article on nuclear energy. As a former nuclear power-generating engineer – I solute him for that. Furthermore, nuclear powergeneration and making nuclear bombs are two different things. First is a country’s necessity to industralize – the later is to bully and exploit other countries’ national resources. The subject does not lend itself well to «Do The Math» − it could all too easily become freakonomical. Nevertheless, I think we should all be grateful to Dr Murphy for this essay. First, there have been requests galore. And although much of the essay and the commentary are unavoidably squishy, nuclear truths cannot be taken for granite. A common complaint about going nuclear in a big way is that so much is unknown (neglecting supporters’ insistence that enough is known). Insufficient attention is given to that the energy needs are massive and alternatives are sparse and meager. I like the recommended approach. We need to be aggressive in pursuit of multiple technologies that can mitigate fossil fuel decline, and nuclear is one of those technologies—I have no doubt. At the same time, we need to be cognizant of the unique drawbacks of nuclear, public resistance, complexity against a backdrop of disarray, and similar challenges. And yes, learning to get by with less is a potent tool and, better yet, is actionable by us as individuals. Is it really a major concern when the alternatives are far less compelling? If the risks of not solving the energy crisis are economic collapse, more poverty, and an increase in the possibility of nuclear war, why would we let negative public opinion deter us from advocating the solution? Should we not re-double our efforts in conveying the risks we face and the possible courses of action? Not being able to clearly explain the situation would be a failure of democracy and our social networks. This is our most effective short-term strategy for dealing with a declining resource, but it will not make the problem go away. Unfortunately, basic development strategies in the United States instituted years ago under completely different assumptions will also make this very difficult and expensive. Furthermore, most of the world remains in poverty, testament to the fact that the energy problem has never been solved. If a particular nuclear technology turns out to have the promise to dramatically lower costs, why wouldn’t we aggressively pursue it for reasons of national security, business competitiveness, and poverty reduction? Of course, if it turns out that it is impossible for us to substantially increase the net energy attainable with any carbon-free technique like the MSR, then we are going to have to seriously rethink civilization and democracy to avoid the worse effects of this transition and decline- the problem I was thinking about (for about 10 years) before hearing about the MSR. I do not think it is an exaggeration to say that if we do indeed have an energy solution, the problems we face shrink by magnitudes. Actually, it does. Like all central-generation plants, there are sometimes occasions when a nuclear plant must shut down or drastically reduce its production. If the outage is a planned one, say for maintenance, it’s not so big a deal. But unplanned outages happen, too. For example, if the cooling water source gets stops flowing (drought) or gets too warm (heat wave). Or if there’s a flood or earthquake (or both). Since nuclear plants have higher worst-case scenario risks that coal or natural-gas baseload, they may have to be ramped down in the face of a natural disaster when a coal plant would not. Finally, the fact that these plants are so massive (due to economies) means that one unexpected shutdown has a much bigger supply effect than the shutdown of a smaller generator (e.g., gas turbine) would. Among other things, this sort of risk management consideration argues in favor of a diversified portfolio of energy technologies and sources. While it’s instructive to evaluate the potential for individual energy systems (and I’m obviously a fan of Tom’s articles), let’s not forget about the need for diversification. You are implicitly assuming that all uses of oil will be sacrificed equally as supplies of oil decline. This is incorrect; in fact, the economy will sacrifice the least important uses of oil until all it’s all exhausted. As a result, nuclear plants won’t have their oil (or other resources) sacrificed until all oil is nearly 100% depleted. By then, alternatives will have become far cheaper, and we will have started manufacturing artificial hydrocarbons for essential purposes. You may be interested in my blog, which you can access by clicking on my name above. I wrote an article called “Peak Oil won’t cause collapse” which addresses this issue. I have a few quibbles about “breeders” and what you’ve written about them. The reactor designs that were historically termed “breeders” were indeed intended to make plutonium, but that’s not the same thing as weapons material. The plutonium from a commercial breeder reactor would have been unsuited for weapons production. Weapons grade plutonium needs to be nearly pure Pu239; any significant quantities of heavier Pu isotopes ruin it for weapons use. Weapons grade plutonium is made in special military breeder reactors, which don’t produce power. They’re designed to allow regular access to the fuel load, so that the plutonium can be removed quickly after it’s created. Pu239 has a large cross section for additional neutron captures, and if left in an operating core for very long, too much of it will be converted to heavier isotopes to make reliable weapons material. The issue with heavier plutonium isotopes isnt that they aren’t fissile, but that at least one of them (Pu240, I think) has a high activity level for spontaneous neutron emission. Too much of it in the bomb material will pre-trigger the chain reaction before a super-critical mass can be assembled. The result is a “fizzle” — an impressive flash and a lot of vaporized plutonium spread around, but not the sort of nuclear detonation that can level city blocks. The reason I refer to breeders in the past tense is that, AFAIK, the concept has been pretty much abandoned. At least in its original form, where the fuel rods from the breeder reactor would be removed every two years or so and processed to extract the plutonium. The extracted plutonium would then have been used to fuel other conventional (non-breeder) reactors. For a variety of reasons, nobody really wants to do that anymore. The Gen-IV reactors that are sometimes mislabeled as “breeders” are better termed “burners”. They’re fast spectrum reactors that achieve high net fuel burnup. That’s accomplished by breeding non-fissile U238 into plutonium, same as the traditional breeder concept. But the bred plutonium remains in the core as fuel, and isn’t exported to other reactors. Thorium reactor designs also tend to be “burners” more than “breeders”. They convert thorium to fissile U233 (and some unavoidable U232) just fast enough to keep the reactor supplied with fuel. But one advantage of thorium burners over U238 burners is that thorium is fertile in a thermal neutron environment. U238 requires a fast neutron environment to achieve sustainable breeding. That has various technical consequences that I won’t attempt to explain. But one of the more significant consequences is that the inventory of fissile material in a thorium burner can be one to two orders of magnitude less than what is required in a fast spectrum U238 breeder. That is a BIG safety plus for thorium. Those quibbles notwithstanding, great post! I salute your stand for “doing the math”. The world needs more of that kind of thinking. Nice to see you look at nuclear again. Please note that breeder reactors can be much more that 140 times more efficient in fuel economy than current generation once-through LWRs. Just comparing isotopic ratios does not give a complete picture, since current fuel rods become poisoned by fission products long before all of the energy available in the uranium 235 is utilized. I also appreciate comments added regarding advanced reactors. Note that some of these may use up to about a third of the energy contained in fertile uranium 238, by shuffling, rather than reprocessing, fuel. We have several practical designs for reactors capable of utilizing the fertile uranium 238. These advanced reactors are safer, may burn slower, are often smaller, are more proliferation resistant, and far more sustainable than current light water reactor designs. Unlike hypothetical nuclear fusion powerplants, ground for these reactors could be broken today. This brings up an ironic twist. Consider that the US military is still shooting depleted uranium rounds, and that one such round may contain 300 grams of uranium 238. Roughly speaking, the energy available in this mass would sustain a single person at a western standard of living (10 kWth) for an entire lifetime. Just because it also happens to be dense and pyrophoric, we expediently throw it at our enemies in order to maintain access to the more easily burned stuff. At http://www.iaea.org/OurWork/ST/NE/NEFW/documents/RawMaterials/TM_Vienna2009/presentations/22_Tamada_Japan.pdf is a fairly recent update on progress in experimental marine uranium extraction. Land-based uranium mining produces the stuff at cost substantially below $137/kg, which is equivalent to $1.37-per-barrel oil. Scaleup of the marine operation is projected to bring its costs to $250/kg, uncompetitive with land-based mining, but at $2.50 per barrel-oil-equivalent, low enough to reduce the petroleum industry, if it did not have friends in government, to a shadow of a vestige of a ghost of its former self. There is so much more uranium underfoot than in seawater that seawater mining may well never be competitive. Technical advances in land-based mining may well make the price of uranium so mined a moving target that marine extraction, even as it gets cheaper, may never catch up with. But if a wicked fairy vanished every U atom in the continents, but forgot the oceans, we’d still be pretty well set for uranium for many generations. No need to look at the academic projections for nuclear capital costs; in the US at least we have the job costs for real proposed rectors. Progress Energy started spending money on their Levy County, Fl, AP1000 PWR, 2.2 GWe plant in 2006. The cost now stands at $22B including transmission, or ~$10/W, with no kWh’s produced until 2021. I note that all of the US’s 104 existing reactors broke ground prior to 1974, even if they were completed decades later. This means that the US NRC, which opened in 1975, has never granted license to operate for a nuclear plant newly proposed under its watch. On the subject of the year round capacity of nuclear versus solar in the winter months, I suspect default opinions may rely somewhat on the latitude of the observer. While the worst months on record in San Diego and St. Louis are 60-65% of the yearly average, the worst recorded months in Seattle and Burlington, NH fall as low as 25% and 32% of yearly average at those locations. So the residents of nations such as the UK and Denmark, that share latitudes with Newfoundland, might be forgiven for exclaiming solar *might* provide “virtually nothing” in the dead of winter. The comments on this post really reveal the audience profile; that is, highly educated – and fairly specialized – people. Sadly, I’m part of that group, and we tend to lack the ability to really comprehend the magnitude of the role that incredibly cheap BTUs from oil have played in the evolution of our present hyper complex “developed” global civilization – a civilization which produced us, which we assimilated as “normal” and something that can subsist outside of its evolved ecology. Without things as they are, right here, right now, in our energy supply, entropy will claim complexity far faster than 253U decays. Things as they are simply would not be possible without the reliable and copious and most important, cheap oil we’ve enjoyed as today evolved over the past 159 years. A well evolved organizm, construct, or being, or society – you name it – can’t easily survive when its environment is changed rapidly, and like it or not, all the math in the world won’t trump politics, which will assure the oil energy supply – the supply available to operate all the equipment needed to build a nuclear anything – will decline far more rapidly than it increased as production – flat for 6 years – starts its decline in, according to most analysts including those working for the US military, about two years. These comments would have been impressive in 1957, when MK Hubbert called for the replacement of oil energy with nuclear power. There was plenty of time and money, and remaining oil, to have made the transition. While from an engineering point of view, it’s all possible (given input energy and financing), one really should broaden one’s perspective on energy – as Tom has, but this is a math outlook; while he mentions the sociology he doesn’t dwell on it, for good reason – to include the pesky human traits that impeded Hubbert’s vision of the world we’re living in right now, which would have already been a nuclear powered world, and rather than research thorium any further, go buy a book on how to plant a garden. I have no problem with your Southern heritage; I do not have the grit(s) to get into «ad hominy» attacks. Yellowcake is not U3O8. It is Di-ammonium uranate – (NH4)2.U2O7 . It has to be heated (calcined) to 800°C to be converted into U3O8, which is green. so when Peak Oil massively increases the price of diesel, the economics of nuclear goes out the window. From the ERoEI standpoint, the diesel to run the bulldozers and trucks to mine the Uranium ore, and the energy embedded in the acids and alkalis used in extraction, have to be spent (EI) years before the reactor will produce any electricity (ER). This acts like an energy barrier, and is much worse if you are trying to scale up a vast nuclear program quickly. We can start on such a program, but we can never complete it. The bottom line is that nuclear produces plenty of power, and can be used for thousands of years at least. Don’t you agree? From what I understand the end product that is shipped from the mining site is still commonly referred to as “yellowcake” regardless of its black/brown/green (depending on producer) appearance. Of course all the embodied energy used in the extraction process must be included in an energy balance analysis. By doing so in a correct manner, i.e. not the way Storm/Smith did it, a quite favorable EROEI will emerge. It is quite obvious that all energy sources release GHG to some extent, including wind and hydro. The good thing about nuclear is that it is on a similar level as these. If you’re ready to dismiss nuclear because of the fossil fuels needed for it’s construction and operation, you might as well dismiss all other energy sources as well.